Will we be getting more details soon? 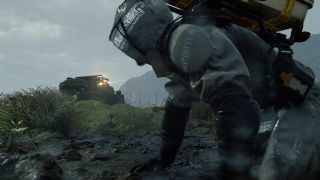 Death Stranding is proving to be one of gaming's biggest enigmas, with no one quite sure what the upcoming title from Kojima Productions is actually about – we're not even sure Hideo Kojima himself knows. But it seems we are creeping ever closer to details on Death Stranding, even if we're still not quite sure what it's actually about. Thanks to a tweet by Kojima, we now know the game has reached an important phase of development and is even capable of running on the PlayStation 4. The following tweet by Kojima (roughly translated by MSPoweruser), explains that while Death Stranding is fairly far along in development, there's a lot of polishing to still be done. "Death Stranding is not yet in the debugging stage, but is currently having all the game elements and tools from different development systems combined into the game," Kojima writes. "It’s a process that involves connecting the parts, adding feeling, looking over the production, the specifications, looking out for trouble, taking things out and adding things in. "I’m playing the game on PlayStation 4 every day. It’s a critical phase." It doesn't exactly tell us much, but it does reveal that the game is far enough along in development to be playable on the PS4 and that Kojima is taking his sweet time making sure all the details are just right. Which is a good thing, but infuriating for those waiting for more information. Hopefully more information on Death Stranding will be revealed during Sony's State of Play conference later today.